International oil plays have produced some big wins in the junior energy markets in 2012. This year alone, companies like Mart Resources (MMT-TSXv) and Africa Oil (AOI-TSX) were huge wins for risk-tolerant investors (Africa Oil—a 10-bagger). I’m trying to stretch my political risk comfort zone by flying into Kurdistan—in northeast Iraq—this week to tour the operations of Western Zagros (WZR-TSXv). It’s in a world hotspot, surrounded by Syria to the west, Iran to the east, Iraq to the south and Turkey to the north. Yet the size of the prize is huge—billions of barrels of oil, and wells that flow over 10,000 barrels a day with low decline rates. I’ll be giving you an on-the-ground report later this week. First, I want to give you a sense of how important this area of the world is in keeping global oil supplies strong. Here is a great introduction by writer Jen Alic. Stay tuned…later this week I’ll be releasing one of my top picks in the international arena for the rest of 2012 and 2013. With an estimated 45 billion barrels of oil and perhaps as much as 6 trillion of cubic meters of gas, Iraqi Kurdistan is using smaller companies—like Canadian listed Western Zagros (WZR-TSXv)—to develop its resources… while gradually luring in the big oil majors, despite threats from Baghdad. 3. setting the stage for independence. And so far, the KRG has the advantage. How do we know this? Oil majors like ExxonMobil, Chevron and Total are willing to sign deals with the KRG at risk of losing big contracts with Baghdad. Another indicator is—Baghdad has finally released its first tranche of payments for oil arrears owed to foreign companies operating in Iraqi Kurdistan. The situation was untenable for both sides, with Baghdad not paying for past exports and the KRG halting exports to Iraq in April in response. That means less Iraqi oil exports, and less foreign currency coming in. It is important to keep in mind that when Iraq announced in August that production had reached its highest levels in 30 years, this was in no small part because the KRG had resumed exports from its fields, temporarily. In September, the KRG and the Iraqi central government ratified an agreement to this end, prompting the KRG to resume exports, tentatively. On 8 October, Baghdad paid the KRG US8.9 million, and the KRG pledged to keep the crude flowing. Whether exports continue to flow will depend on whether Baghdad pays its second tranche—which is about half the first amount—on time. For now, exports from Kurdistan are at about 170,000bpd, with Turkey’s Genel Energy, the lead producer in the region, contributing 110,000bpd of that output. If the deal remains in place and Baghdad pays the outstanding $857 million owed for foreign companies, the KRG plans to boost production to 200,000bdp for the rest of 2012. Until very recently, smaller companies who had the wherewithal to enter the Northern Iraq oil and gas market—such as Gulf Keystone Petroleum, Addax, Heritage Oil, Western Zagros, and Genel Energy—were playing a major role in the region’s energy exploitation. They were on to a good thing, while the oil majors were forced to sit back and hedge their bets. They could not risk angering Baghdad and upsetting their oil and gas deals with the Iraqi central government by dealing on the side with the Kurds. That began to chance late last year. The oil majors grew impatient: The KRG was offering more flexible and lucrative production-sharing agreements and despite modest output, the potential was clearly vast. Iraqi Kurdistan’s oil exports are predicted to reach 1 million bpd by 2015, while the region could produce as much as 15 million cubic meters of gas annually. Baghdad attempted to preempt this by threatening the oil majors, warning that any contracts signed with the KRG would be viewed as illegal. It was not enough to keep the oil majors back. First ExxonMobil signed a contract with the KRG in October last year, and then things began to snowball. Chevron and Total would follow suit, and even Russia’s Gazprom Neft. Baghdad continues to threaten ExxonMobil, particularly as the company prepares to dig its first exploration well in Northern Iraq. There is a lot at stake. So why are the oil majors willing to risk their contracts with Baghdad? They are hedging their bets that Baghdad has more to lose than they do by blacklisting them. What exactly does Baghdad have to lose? Particularly, the Iraqi central government needs massive revenues in order to improve its energy infrastructure and for this it depends on the oil majors. This is why Baghdad hasn’t made good on its threat to cancel ExxonMobil’s contract for the West Qurna field (8.6 billion barrels), near Basra. And no threats have been leveled at Gazprom, which on top of its KRG deals is also developing the central Iraqi Badra field. Chevron, on the other hand, was an easy target: It has no contracts with the central government, so Baghdad lost nothing by blacklisting it. Baghdad also stands to lose the 17% portion of revenues it earns from KRG transactions. Baghdad could move to block the use of its southern pipelines, but it would only be shooting itself in the foot at a time when exports have finally resumed. And with the KRG’s new “independent” pipeline plans in motion, this threat becomes even less significant. But the power showdown is certainly not over. There are much deeper problems than non-payment by Baghdad. Nothing can be resolved without a ratified national hydrocarbons law, which continues to languish in parliament, tainted as it is by territorial and sectarian sentiments. While there is no national law, the KRG has its own oil and gas regulations—and this is good enough for foreign companies operating in the region. 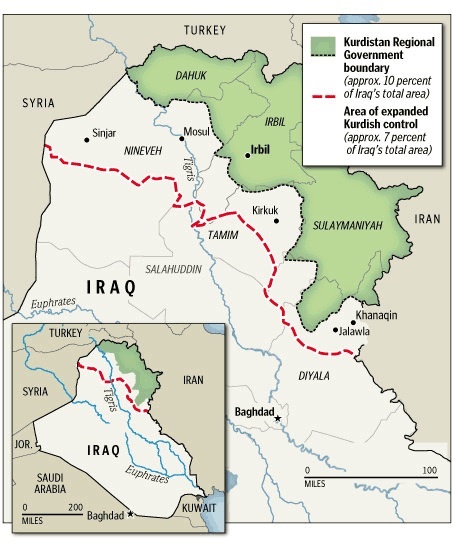 “The end objective is clearly independence, and the KRG has no desire to trap itself into a national hydrocarbon law at this point—at least not as long as independence aspirations continue to be boosted by economics and logistics,” Michael Bagley, President of Jellyfish, a DC-based private intelligence firm advising multinational corporations in Iraq, told Oilandgas-investments.com. But the timing isn’t quite right yet. The events in Syria lend some uncertainty to these ambitions, particularly for Turkey. “Everyone will have to wait for the dust to settle in Syria, which has its own Kurds, to determine how the Iraqi Kurdish question will be answered,” he said. Turkey is the largest investor in Iraqi Kurdistan, and the two conclude some $12 million in trade annually, but it also has considerable interests in the rest of Iraq. This double game is becoming somewhat problematic for the Turks, and the first week of October saw Baghdad threaten to take diplomatic action if Ankara continued to launch cross-border raids on Kurdish militant positions in Northern Iraq. Suddenly, for Baghdad, this is a question of sovereignty. But what it’s mostly about is economics. Turkey began importing crude from northern Iraq in July, bypassing Baghdad. Worse, the KRG and Ankara are planning additional pipelines connecting Northern Iraq and Turkey and affording the KRG significantly more control over its oil and gas resources—and less concerned about payments coming in from Baghdad. Two new pipelines would pump crude from Kirkuk, in Northern Iraq, to Ceyhan, in Turkey. The first is scheduled to come on line in August 2013; the second, in early 2014. This would all tie into the Baku-Tbilisi-Ceyhan (BTC) pipeline and its capacity of 1 million bpd of oil Caspian oil. Expanding the BTC to include sizable Iraqi Kurd output would turn Ceyhan into a major hub. Furthermore, the Turks have contracted out an infrastructure project to transport Kurdish natural gas to Turkey.With this in mind, the KRG is busy negotiating future contracts with energy majors, though no one’s willing to go into detail on this. Geopolitical dynamics aside, if this situation is to be resolved, and if the central government is to maintain some semblance of control over the KRG, it will be Baghdad that has to budge. There is, however, a legal hiccup related to the KRG’s oil and gas law, specifically with regard to Kirkuk, the hub of new pipeline activity. Kirkuk’s official status remains unresolved and it is not officially under the KRG’s jurisdiction, though this is how it is treated. A referendum on this issue is long overdue and this is one weakness Baghdad will seek to exploit.